Kill all the people having fun simulator. 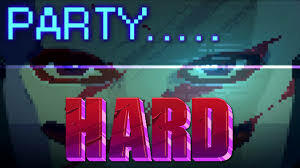 In party hard you are given a party scene in which everybody is singing, dancing, vomiting, passing out or whatever it is people at parties do and you are tasked with murdering everyone without being found out as the murderer, you do this by finding the party goers that are on their own and kill them, there are also many traps around the level that you can use to kill people by “accident.” If you are found out a policeman will come and attempt to arrest you (you can outrun him) Completing a level will award points for the classical arcade high score experience as well. The story is very tongue and cheek as you are slowly killing a party because you wanted some sleep at early hours in the morning. then again although it is highly self aware with its narration and story line there are genuine twist and turns. The art style is very bright and colorful. It is comparable to Hotline Miami with its art and gameplay with failure meaning that the level is going to restart. The soundtrack though is one of my favorite parts of this game. The music is phenomenal and is a great addition to my music library the pulsing electro is very catchy and upbeat. The biggest problem with the game though is that the last 10-20 people can become very tedious and a drag when trying to single them out, although there are environment traps to kill passerby’s there are no distraction tools for you to single them out so it does become a waiting game. Even with a short 12 levels + new DLC the game is relatively short and could be finished in an evening but that doesn’t mean it doesn’t outstay it’s welcome. It is a good day spent but once finished it’s not something that you would come back to most likely. Sombra has a great new Overwatch update for you! Can gaming count as a physical sport?